Having lived in Florida for a good part of my life, I have come to appreciate the beach and a great sunset. The other Sunday, BD and I combined three of my favorite things for dinner: a sunset, hot lobster rolls, and champagne. Hot lobster rolls are one of my all-time favorite dishes. In fact, I would die a happy woman if it’s my last meal. Many people are only familiar with the cold rolls which is usually lobster mixed with mayo and some other ingredients. I am anti-mayo. I’ve never liked it and the few times I’ve eaten plain (by accident, I’ll add) I’ve broken out in hives. Anyway, a hot lobster roll is lobster, a hotdog-like bun, and butter. Lots of glorious butter! Lobster rolls, both hot and cold, I sort of consider regional fare. Reason why is it’s hard to find as a regular menu item anywhere outside of New England. And apparently, hot lobster rolls are more popular in CT than the rest of New England. Below is the “recipe” on how to prepare your own hot lobster roll. If you like lobster, I really recommend you trying this one day. 2 –Add your lobster to the butter. Allow to slowly warm for about 10 minutes or so, depending on how much lobster you have. 3- Once hot, strain butter and place in bun. Be sure to have some other melted butter on side for dipping! In addition to the lobster rolls, we purchased some pasta salad from our local grocery store. We chose tomato and basil pasta salad that also had grated parmesan cheese and onions with an Italian dressing. It was very tasty, and a great side for our picnic. And of course there was plenty of sunset and champagne! I picked up a neat little trick from this past season of The Next Food Network Star. Melissa d’Arabian (who was the winner) spoke about taking scallions and placing the ends, or white part, in a glass of water so they could regenerate. I was intrigued by this because I love any opportunity to save some money. 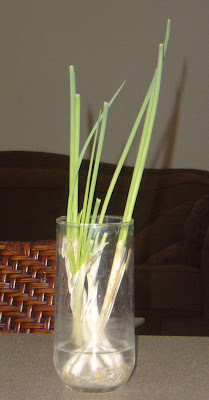 A few weeks later, I had purchased some scallions and took her advice and gave it a try. Turns out, it works really well. In fact, I’ve had to cut them back a couple times because they grow so quickly. After the first trim I made, I decided to take some pictures to share. These pictures were taken just one week apart. All I did was leave them in a glass cup on my kitchen window sill which gets a decent amount of afternoon sun. I change the water about once a week. Pretty crazy, huh? I haven't a chance to catch Melissa's show yet, but I'm planning on it to catch any other neat tips she may have.